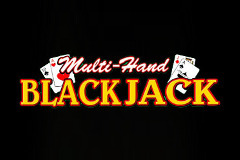 Multi Hand Blackjack is exactly as the name suggests, a traditional version of Blackjack with the choice to play multiple hands at any one time. Created by Players Suite, Multi Hand Blackjack users a set of six decks of cards returning an RTP of 99.53% when played to the optimal strategy. Each hand can have a minimum bet of 10p, or 10c if your currency is set to Euros. The maximum per hand is £1000 which gives players of all budgets a game they can enjoy. Once you have selected your desired stake and chosen the number of hands you wish to play, press the deal button to be dealt two cards, face-up for each active position. If the dealers face up card is an Ace, the option of insurance will be offered, otherwise you will be able to continue your hand as normal. You may double down on your first two cards no matter the total value, however I would recommend only doubling down on a 9, 10 or 11 and only if the dealers up card is between an 8 and a 2. You may also split your first two cards, however there is no re-splitting allowed beyond the initial split. Any two of the same cards may be split, however think wisely before making certain decisions, do you really want to split two tens and ruin an already good hand? Once you have played your cards, the dealer will attempt to beat you following basic Blackjack rules. The dealer must deal up to 16 and soft 17. Any value beyond that the dealer must stick. Any winning hands are paid as double, with Blackjack paying 3/2.